The heart chakra, located at the centre of the chest, is the bridge between your lower self (also known as your “ego” self) and your higher self and the chakras that correspond. It’s the point of contact between your soul and body. It is the centre of revelation and has been said to be the chakra from which all 72 000 nadis originate. Loving energy is centred and flows from here. This is where our sense of compassion, altruism, love and kindness is born and spreads from. When in balance, not only are you able to give love freely without requiring anything in return but to easily and openly receive it – receiving is an important part of giving. This air directed chakra governs your heart, lungs, shoulders, breasts, arms, chest, thymus gland and cardiac nerve plexus. Anahata means unstruck sound or the sound of oneness, cosmic or inner sound, which can confusingly also mean the soundless sound of silence. The yantra is depicted by a twelve petalled lotus and is often seen as grass green or rose pink or a both. In the centre of the lotus are two triangles – one pointed upwards and another inverted. The upward point triangle represents Shiva, who is the deity for unmanifest consciousness or potential and is about returning to the Divine source through spiritual awareness. The inverted triangle represents the deity Shakti, who embodies the principle of manifest creation (or potency) and relates to our earthly and material being. When the energy is flowing freely the two distinct “entities” are in balance and harmony and work well together. 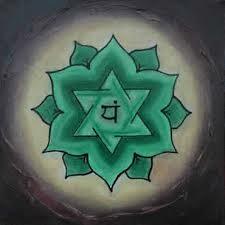 Anahata chakra accepts and loves others unconditionally. Each person is viewed as a unique embodiment of perfection, acting according to his or her own nature. Anahata accepts both positive and negative qualities. Have you noticed that when you have been hurt or are unwilling to give externally that you shoulders seem to slump forward in an attempt to protect your chest region? increase air movement around you by hiking, opening windows, climbing a tree, going on a ferris wheel or spending time at a lookout with a view. You can also dedicate your practise or day to someone you love or would like to extend love and compassion to. Some days, that may be yourself and a great activity to enhance self love is to write a list of all your good qualities and reflect on it regularly. Nadi sodhana or full yogic breathing pranyama as well as hridaya mudra (heart mudra) helps to bring the chakra in balance. Hridaya mudra diverts prana from your hands back to your heart centre and unburdens the heart. Have questions about some of the practises mentioned throughout this blog? Ask your yoga instructor, leave a question below or keep an eye on our Facebook page for further explanations. Did you miss our posts on Manipura, Svadhisthana and Mooladahara chakras?